What Are the Friendliest Parrots? Small to medium-size parrots tend to be friendly and easy to care for. So you’ve decided you want to bring a feathered friend into your family. Great idea. As a newcomer, you'll do well to choose one that's friendly. While temperament varies from bird to bird, a handful of domestic parrot breeds -- most small to medium-size -- are typically more friendly than others. Among the smallest members of the parrot family are canaries and finches. Both of these fast-flitting birds measure 4 to 6 inches long and live five to 10 years. A variety of types of finches and canaries are available. They are sociable, docile birds who do well with children. As a bonus, male canaries will fill your home with lovely calls or singing. These affectionate parrots are aptly named. Lovebirds interact easily with family members. Intelligent and inquisitive, lovebirds quickly learn entertaining tricks. When paired, these 6-inch beauties will pay more attention to one another than to their human companions. Get a solitary one if you want to interact with your bird. These lovely birds are hardy, living about 12 years on average. 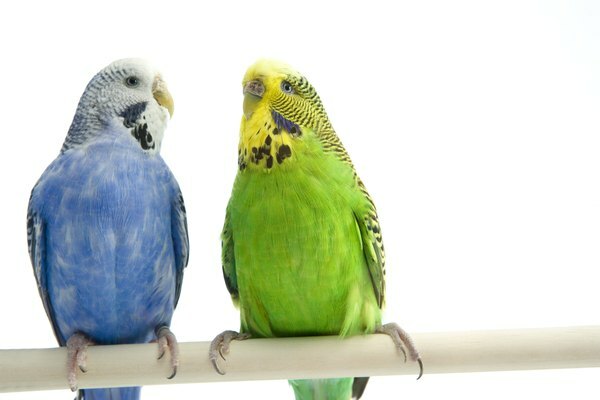 With their quiet chirps and ease with people, budgerigars make low-maintenance parrot companions. Budgies (Melopsittacus undulatus) are one type of parakeet, the most common pet variety. Budgies averages 7 to 10 inches long, and live about eight years. Other species can live up to 15 years. Try a Bourke’s or Lineolated parakeet for optimum friendliness and affection in this genus. Among the many types of these playful birds, the quietest and friendliest tend to be the half moon, green cheek and peach front types. These adorable parrots delight in clowning around and learning new tricks. They grow to about 10 inches long and live about 15 years. What's white and yellow and "surfs"? A caique. According to BirdChannel.com, caiques are incredibly affectionate with their signature "surfing" move: rubbing their bodies against a person's hand while perched on it. About 9.5 inches long, they love to climb and show off. They can be a bit on the noisy side, so keep your bird occupied with toys and train her well to be sure she won't bother you or your neighbors. These colorful parrots live to be about 30 years old. Meyer’s parrots grow to about 9 inches long and, according to BirdChannel.com, are comical birds with calm dispositions. They love human attention but are also pretty content to play with toys on their own. They live to be about 28 years old, and their noise level is low, making them ideal for apartment or condo living. Approachable and easy to care for, cockatiels make great companion birds. They enjoy perching on a person's shoulder and nibbling on her hair. Try teaching your cockatiel a tune to whistle -- the males, especially, love to whistle. These cuddly members of the parrot family live 20 years on average and grow up to 13 inches long. While larger parrot breeds such as macaws and cockatoos are beautiful and smart pets, they can be "difficult and demanding to live with," according to the Humane Society. The larger the bird, the louder it can be, and large breeds require a great deal of care and are prone to behaviors that aren't as friendly, such as screaming and biting. For the sake of the birds' well-being and your sanity, it's best to leave these parrots to experienced parrot owners. Jennafer Martin has more than 14 years of experience in writing, editing and brand management for literary, business-to-business and consumer publications. She is a writer for Zoe Soul Spa and "Pets in the City" magazine.